everyone in the world looks up at the same sky. Lenses on the Sky is a large scale environmental installation that permanently resides outside of OMSI’s newly redesigned Planetarium. 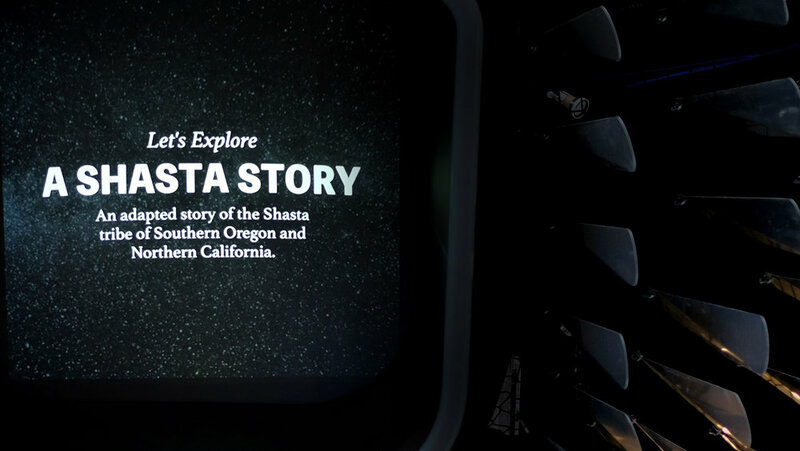 This interactive installation pairs the study of space science with cultural stories from across the globe and investigates how humans across time have interpreted the stars and imagined the exploration of new frontiers. The installation is composed of five cedar wrapped vessels that protrude from the ceiling from within a skyscape of hanging aluminum forms. The sculptural skyscape reshapes a heavily traveled corridor and inspires kids and families to look up. Collaboration with Skylab, Thomas Wester, Kirsten Southwell, Alyssa Glass, Valar Engineering, and Airstream.